Our PSD to WordPress service is designed to ensure that your website is as visually absorbing and responsive as you intend it to be. We replicate your Photoshop PSD web designs and convert them into functional and interactive websites without compromising on the quality of the design itself. Our WordPress solutions are executed by addressing all your design requirements, no matter how detailed or small they may be. We cater to the diverse web audience by building a website that is compatible across multiple platforms and devices. We take great care in coding your pixel-perfect design files to ensure that the outcome is attractive and inspiring. At webdeveloper.sydney, we understand the importance of the singularity and business value of a design. This is why we convert your designs to beautiful WordPress themes in a manner that does not take away anything from the design itself. Utilizing the capabilities of the extensive WordPress platform, we extend the scope of your visually appealing PSD designs to incorporate rich functionality and high responsiveness. From multi-faceted themes to custom plugins, we provide you with websites that go beyond the standard requirements and specifications. Our delivered products are a reflection of our reputable image and amazing track record of producing highly functional, interactive websites for clients from around the world. Our web design solutions are the complete package that facilitates you with everything you need to market your business online. 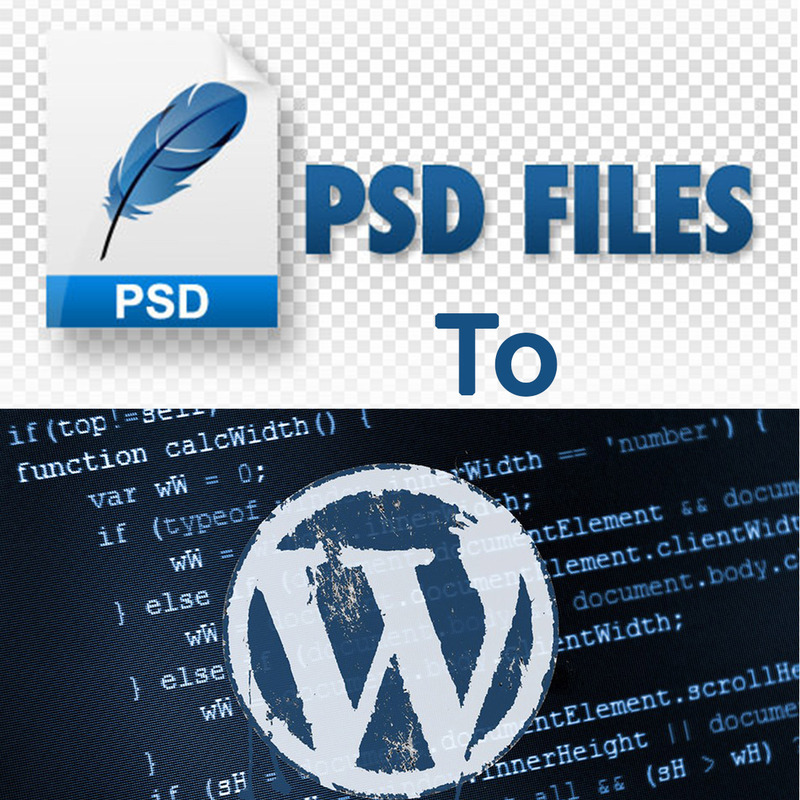 What is PSD to WordPress theme conversion? Adobe Photoshop is one of the most popular photo-editing and designing tools in the world today. Artists and designers make use of the powerful tools available within Photoshop to create their masterpieces. Today, due to the rich functionality that the software has to offer, entire website templates are designed on Photoshop. This is because Photoshop allows designers to detail each element on a web page perfectly according to the website owner’s requirements. However, all Photoshop designs are in the .psd format that cannot directly be published as websites. The real challenge lies in converting these PSD designs into WordPress themes so that they can be published as fully functional websites. While Photoshop has made it easy to actually design the website, there is still no coding involved. An expert designer on Photoshop will be able to produce a PSD design of how your website will look but at the end of the day, you still need a skilled team of web developers to make the design functional. This is where services such as webdevelopers.sydney come to the rescue. Here, we have a team of highly skilled, professional web designers and developers that are not only proficient at coding but have an in-depth knowledge of Photoshop as well. Their knowledge of Photoshop enables them to understand how each PSD design was made and how it can be converted into code. Our team of web developers analyze your PSD designs and convert it into a WordPress template that incorporates not only the design features but functional elements into the website as well. We make sure that your business’ website is not only beautifully designed but responsive as well. We recognize that most internet users today use smartphones as their primary device of choice for accessing the web. Knowing this, we implement your website design in a manner that it is compatible across several devices and platforms. Even if your PSD design is just generic for all devices, we adapt the design so that it is supported on smartphones, tablets, notebooks, and desktops. We make sure that you stay ahead of your competition by delivering a website that is responsive in design and interactive in functionality. The main goal of a website is to be visible to its target audience. In order for a business to succeed, it is essential for it to build and maintain a strong online presence. For this purpose, a technique known as search engine optimisation (SEO) exists. Through SEO, a website’s visibility to search engine increases and thus leads to better indexing of the website on search engines. The better indexed your website is, the higher the chances of generating relevant traffic. For this reason, we place the elements on your website in an SEO-friendly manner to ensure that your website achieves better ratings from search engines. Moreover, our team of SEO consultants also analyze and modify the content to be placed on your website for best results. Our team of designers has a vast experience of working hands-on with numerous WordPress themes that help them understand the different elements that go into innovative design. They analytically assess your PSD designs and identify what needs to be put into the code for the website design to make it creative, beautiful, and appealing for the users. We build WordPress themes that make your website stand apart from all the rest. The themes incorporate interactive elements and beautiful design features that adapt seamlessly to all screen sizes without compromising on the appearance of the website itself. A common problem encountered during PSD to WordPress conversion is that the final outcome is not up to WordPress’ standards and guidelines. All WordPress themes have to follow a set of predefined guidelines and standards before they can be published. This is why it is essential that web developers understand what can and cannot be a part of a WordPress theme. At webdevelopers.sydney, we take caution in coding your PSD designs to WordPress themes to make sure that they are all WordPress validated and ready for publication without modification. If there is a necessary change needed for a particular design element, we inform you beforehand and discuss the various alternatives that can be chosen to replace it. Unlike most of our competitors, we offer true value for your investments in our services. Our wide range of dedicated WordPress services are available at rates that are affordable for even small startup businesses. We have a variety of packages available that are suitable for all kinds of businesses. Our high returns on investment ensure that you contact us for all future website development tasks, no matter how small they may be! Our WordPress development and integration services are handled by a team of highly skilled, experienced developers that have a systematic procedure for accomplishing tasks assigned to them. Starting from the analysis phase right up to the testing and maintenance phase, our team of dedicated developers has everything covered. Through the use of advanced technologies and tools, our developers and designers ensure that all your requirements are met with high-quality code that facilitates you with everything you need on your website. Uniqueness is an attribute that is too often undervalued, especially when it comes to website design and functionality. Customers love innovation and this is why it is essential for you to have a fully customized website for your business. Our developers put in their best efforts to convert all elements of your PSD design into customized ones suitable to your business’ requirements. Through the creation of a customized website, we make sure that you offer an exclusive experience to your visitors that speaks out volumes about your brand. We make sure that all your custom requirements are catered to and even pinch in ideas of our own to ensure best results for those that matter the most, the customers. Before designers turned to Photoshop for creating templates for websites, the entire web development process was usually handled by a single team or agency. This made sure that all work was completed in due time. However, now it has become increasingly difficult to produce a website in quick time. Once the PSD design is complete, it has to be analyzed for correctness and then has to be coded by front-end developers. A task that is not only extensive but difficult in nature. Recognizing this and respecting your time constraints, we put in our level best to hand over the deliverables within the deadlines that you set. With years of experience of handling web development projects, we ensure that our work is delivered in quick time without compromising on the quality of the website. All your requirements are met without you having to wait for even a single day! When it comes to code, there are numerous ways of getting the same thing done. What matters is how efficiently it has been done. We set high standards for the quality of code we deliver. We do not believe in producing code that is technically difficult and complex to understand. Instead, our code is well-formatted, properly annotated, and easy. This ensures that future developers that work on the code can easily change it and maintain it (if you do not opt for our after-sales maintenance services). We are a professional and friendly group of individuals that love communicating with our clients. We keep you consistently updated with the progress on the project while incorporating your requests on every step along the way. The professionals here at webdeveloper.sydney believe in working hand-in-hand with the clients to ensure best results. Not only do we provide you with 24/7 support throughout the development process but we facilitate you with free after-sales support as well. You can reach out to us for any queries or maintenance requests even after the theme has been delivered to you! We understand that you want to be able to take control of your website without having to deal with the technicalities of the back-end code. While others will simply just convert PSD to WordPress theme (front-end development), we also customize the back-end code of WordPress for you as well. This allows you to do is to edit content and layouts on your website through a simple and interactive interface without having to know the technical details! Through the implementation of a basic and customized content management system, we give you complete control over everything on your website so that you do not have to contact us (or other developers) for making subtle changes to your website and its content. Ordering: You place an order request with us that accompanies the PSD design files (that have to be converted) and your exact requirement specifications. Review: We check your requirements and the design files to discuss the project further with you. Our sales team gets in touch with you regarding the estimated time and budget for the project at hand. Analysis: Our team of professional developers and designers sit together and assess the PSD files to determine the feasibility of WordPress theme conversion. They keep in touch with you on a consistent basis to discuss changes and improvements to the PSD design before development. All individual design elements in the PSD file are isolated and analyzed before the design is approved for development. Development: Once the design has been approved by our development team, we start working on the code for the WordPress theme. Our web designers take care of the front-end coding for the theme while our web developers handle the back-end coding. We keep you in the loop during the development phase in case of any problems or questions regarding the design. Testing: The completed WordPress theme is then put through various tests for correctness. First, we check the implemented code for bugs and crashes and then we check if all the requirements mentioned by you have been fulfilled in the code. Once the theme has been thoroughly tested, we send it to you for final review. Delivery and review: We deliver a finalized, well-tested WordPress theme to you that is given a review period so that you can perform testing of your own. If there are any issues or changes to be made, you inform us and we start over from Step 1 once again. Maintenance: Even after the WordPress theme has been delivered (and published online), we keep in check with you to see if you require any assistance or maintenance work on the developed theme. If there are any changes necessary, our after-sales services take care of it without giving you a single chance to complain. With the growing demands of customers on the internet today, there is a need for thoughtfully designed, innovative websites. This is perhaps one of the main reasons why designers have now resorted to applications such as Adobe Photoshop for designing website templates. The powerful features in the software make it easier and more flexible for designers to let out their creativity. However, this is just one part of the whole scenario. Once the design has been made in Photoshop, it is exported in a file format known as PSD. This is where there is a need for skilled web developers that can not only code well but have a sound understanding of PSD designs as well for PSD 2 WordPress conversion. Webdeveloper.sydney is an agency that offers incredible PSD to responsive WordPress conversion services that take care of everything for you. From isolating design elements in the PSD file to high-quality back-end code; our services handle every step in the conversion process with great care to deliver a powerful and responsive WordPress theme to you. Not only this but our team of expert designers analyze and assess your PSD designs for suggesting improvements and modifications according to your business’ requirements. Perhaps the best part is that we offer all of these services at unbelievable prices that are suitable for all businesses, no matter how big or small. So, if you are a website owner that is looking to get your PSD designs converted into functional WordPress themes, then you are in the right place.